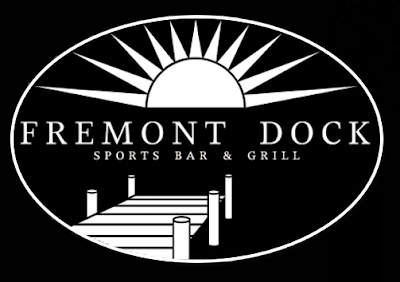 5 of 5 DeliciScore™ (From Heaven) Awarded to The Fremont Dock for their Prime Rib Dip Sandwich in Seattle, WA on this 30th day of November, 2015 - These people put some love into their Prime Rib Dip. 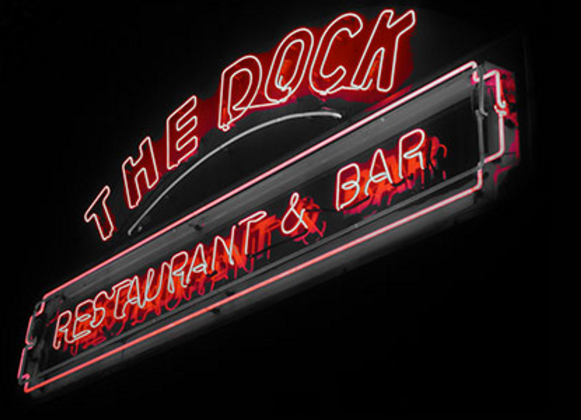 I went out to lunch today with some coworkers at a place called The Dock which is really near our office in Fremont. I typically work out of our Kirkland office but find myself in Seattle at least weekly where I can get to know the crew over there. The purpose of our lunch out today was to welcome two new hires to the company: Mimi from Austin, TX and Todd from Vancouver BC. We made nice chit-chat with them and welcomed them hartily to the company. We got to learn about each of their commutes, more about their stays and training plans, and Todd's history as a long-haul trucker turned data boss. (He's driven in all 50 states except Hawaii and all Canadian provinces.) Internally, I felt happy to see that new people are getting added to our group and I would therefore not be "the new guy" for too much longer. 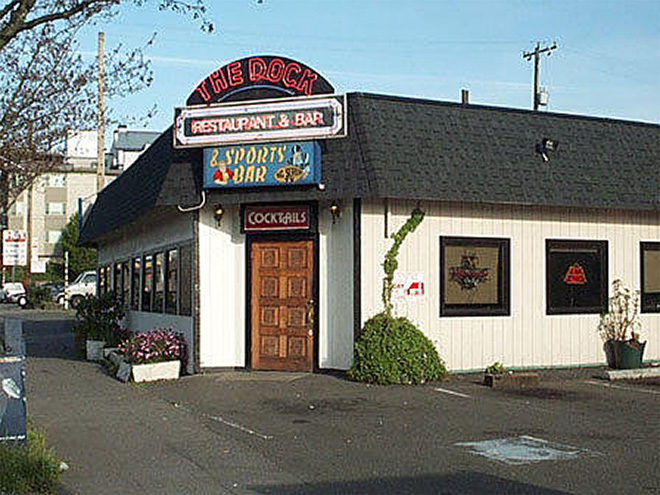 The Dock is a neighborhood bar and grill in Fremont that's really close to our offices there. I'd been twice before (it's impossible to resist going there, since it's so close and the food is reliably good). Our boss Peter today referred to it as our cafeteria, jokingly. There were five in our party and we arrived before 11 so there was no crowd. I had to run to the restroom when we arrived and I was pleased that it smelled like bleach and/or Clorox, a sign of cleanly freshness. We were greeted by a friendly waitress and promptly offered cold ice waters. Another quick point of note is that A1 Steak Sauce lives on the table, which pleases me, innately. When it came time to order I said I'd have "the French dip" (I wanted to be all nonchalant about it but was immediately called out by Mike who knows of my blog and hobby doing this). I intentionally didn't call it the Prime Rib dip since that sounded pretty highfalutin for a company lunch even though it is just a sandwich. Mike made me share about my hobby with the rest of the table and encouraged me to take pictures, too. I was embarrassed of my hobby but that was fine. Here's The Dock from the outside. I lifted this picture off of Google Images. My apologies, Internet and its citizens. More internet robbery, their logo. Thank you, The Dock website for this graphic. So here's there dips on the menu. Note they have two. 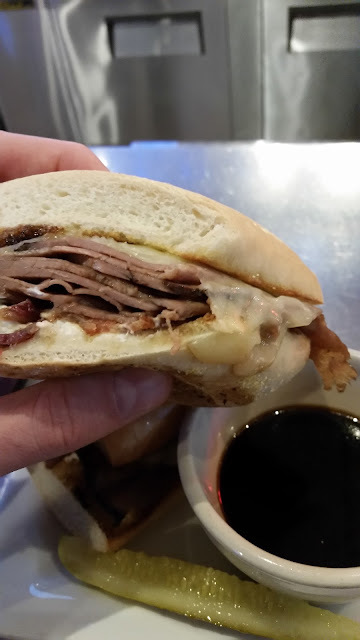 I ordered the Prime Rib French but only said out loud that I would like the French Dip since that seemed safer than getting something too "all high and mighty". Note the thinly sliced herb roasted prime rib (I'm not sure that they cut it fresh, though so the meat gets a 4 of 5). Aged Swiss was nice. And French baguette. They weren't messing around with the bread, it was great. Here it is served. Note i had already added A1 Steaksauce for my fries and I was excited about that. The sandwich itself is a very generous portion with delicious and beautiful bread. Jus comes in the standard jus cup. Fries were plentiful. Everything looked really good. I was immediately impressed. Perhaps not as fancy or as refined as a Ruth's Chris dip but this thing was looking pretty good, especially from the bread. A closer shot of the sandwich proper. And an even closer shot of the sandwiches innerds. They're looking prettty good. Not too much cheese. The cheese was a really nice compliment and the bread was nicely toasted and buttered as it should be. Here's the jus. I let it get a bit cold since I started with my fries but it was good at a 3 of 5. Overall this dip scores a 5 of 5 for the quality of its bread which is toasted and buttered, good meat, fancy cheese and a good jus. Nothing wrong with this dip. Hopefully it is a staple in the diets of the Fremontians. While visiting Portland with a friend of mine, we spent the day exploring and getting stamps on our McMenamin's passports. 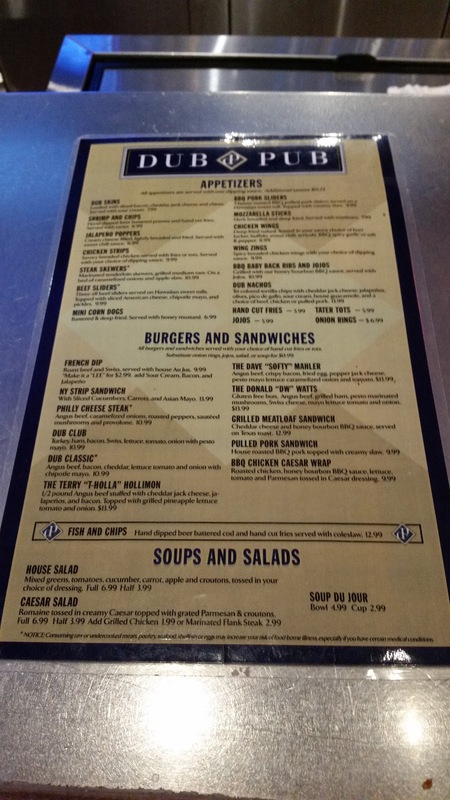 Our final stop of the day was for lunch at the downtown Portland pub, the Market Street Pub. While I do not share Eric's dedication and enthusiasm for French Dip sandwiches, their Portland Dip sounded like just the thing I wanted on a rainy November day. 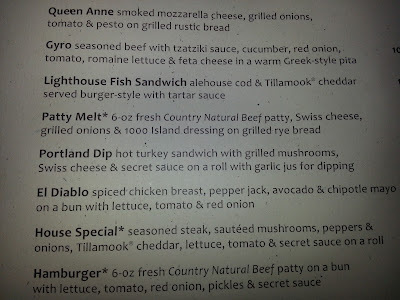 The menu description sounded promising, and as a general fan of McMenamins restaurants I decided to review this to see if we could redeem them for their lackluster dip Eric and I shared a the new Bothell property. So, without further ado, here goes! This dip is not a "traditional" dip in that in comes with turkey, instead of beef, but that made it sound that much more appealing to me. 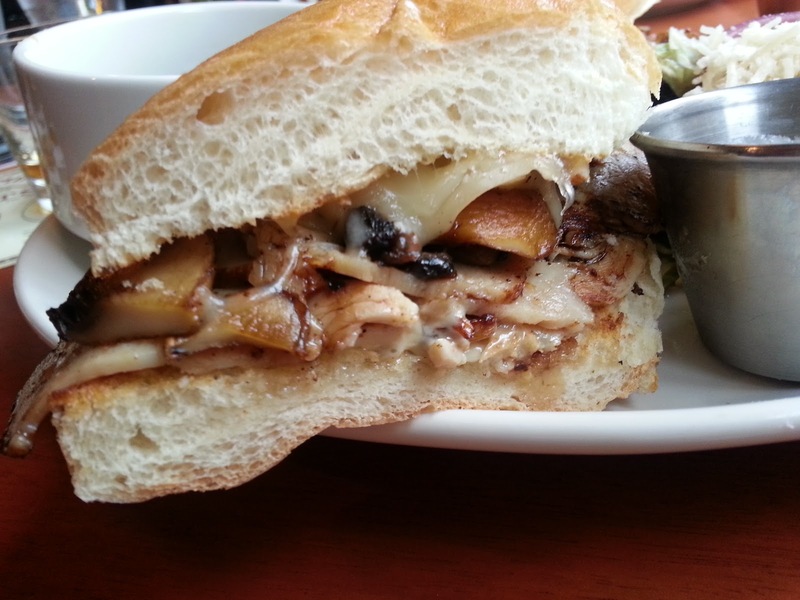 The toppings included grilled mushrooms, Swiss chesse, a secret sauce and a garlic jus. As you can appreciate below, the initial presentation was quite pleasing. There was a reasonably thick slices of turkey layered among the mushrooms, Swiss cheese and secret sauce which was tasty, and not too plentiful so it didn't overwelm the sandwich. 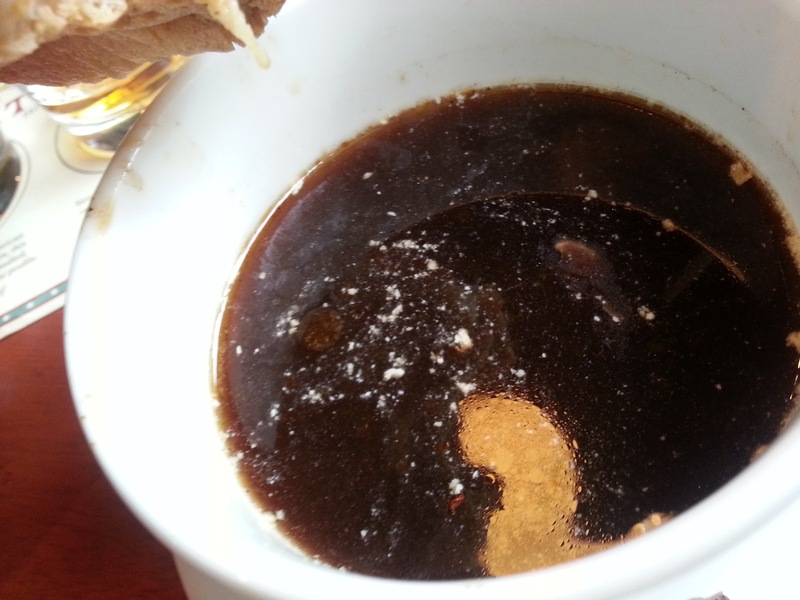 Once dipped into the jus, the bread, which was warm, the "right amount" of soft with a gentle golden crust and an absorbent center that soaked up the jus nicely. The jus itself was flavorful, served at a nice temperature and there was plenty of it. It had a nicely deep color, moderate fat droplets, and a mild but rich flavor. It didn't have an overwhelming garlic flavor and it was not overly salty, like other jus I have tasted. 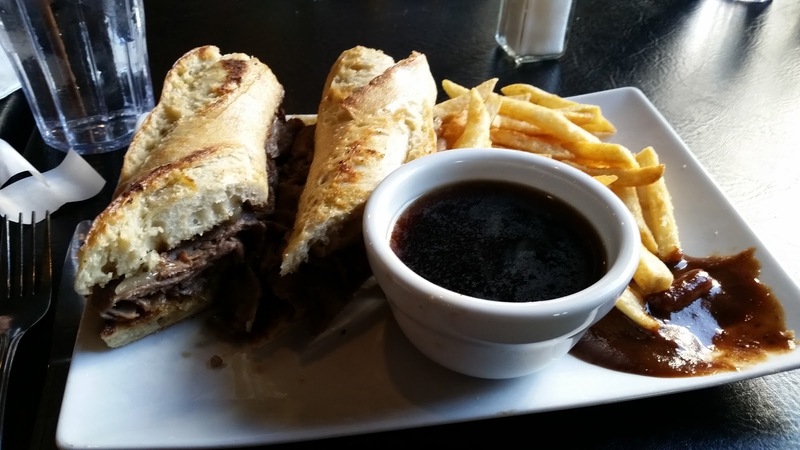 The portion size was more than I needed, but probably a good size for most French dip enthusiasts. I chose to finish the green salad (which was also good) instead of the whole sandwich so I was saddened to leave the remnants behind.They packaged up the rest for me and I finished it up for dinner - as a side note, I had to eat it cold but it was better than I thought it would be! 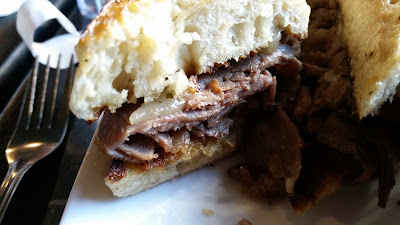 For someone who is not "into" French Dips, this was a very delicious sandwich that I would happily eat again. It was very tasty, not too heavy, and a perfect warming meal for a cold rainy, pacific northwest day. 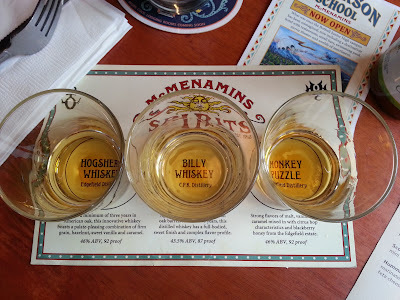 My beverage accompaniment was a selection of McMenamins whiskeys which were all tasty. My personal favorite was the Hogshead whiskey. 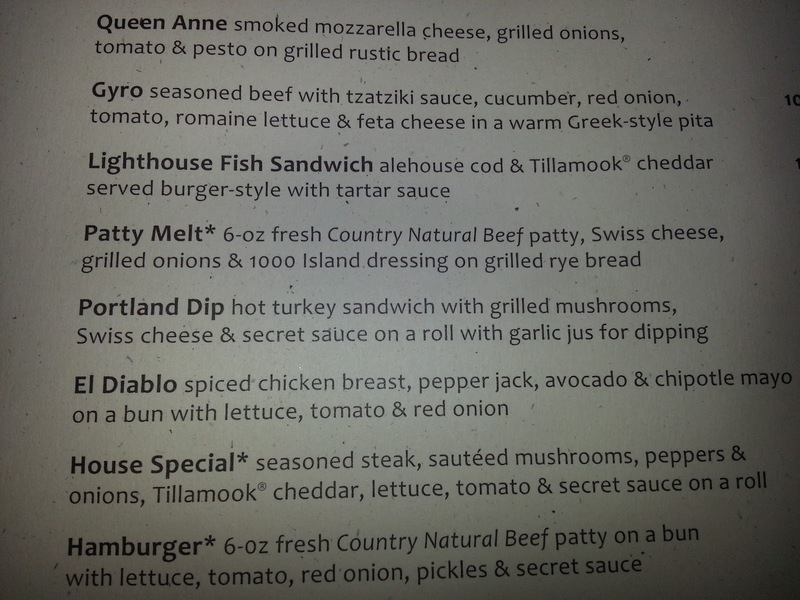 In summary, the Market Street Pub fully redeemed the French Dip sandwich with their Portland Dip. 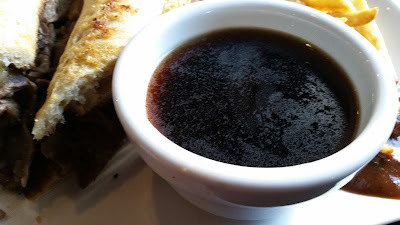 I would encourage any French Dip fans who do not require beef on their sandwiches to enjoy this delicious dip. 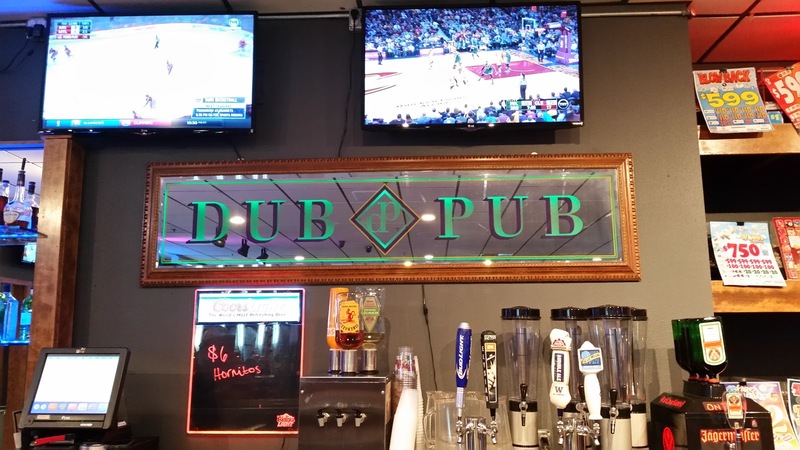 I wound up at Dub Pub after work. The plan had been to meet up with a few friends but those fell through. I wanted to go drink a beer and meet up with Jessica anyways so I showed up. My good buddy Nate from Western was there (he bar tends there). He was awesome and offered me a cheap tall can before I ever even said hello. He showed me the Rainier can and the Busch Light can. 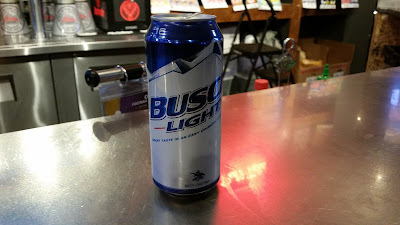 Rainier was 50 cents more so I chose the Busch light. I'm not made of money. I sat at the bar and was waiting for Jessica. I was getting hungry. Nate asked me if I was going to have the "LEE", which is a bacon, jalepenos and cream cheese on a French dip and Swiss. My hunger overcame me and I ordered it. I got to choose between a variety of fried treats. I asked if I could get a side salad instead. Yes, I could. I ordered one with bleu cheese. Here's one side of the menu: the fancy side with dinner options (and there's another side as well with more standard pub faire. They had a special the night I was there featuring short ribs in veal stock. I was impressed that they had nice food and not must burgers and fries. Here's the side of the menu with the standard faire. 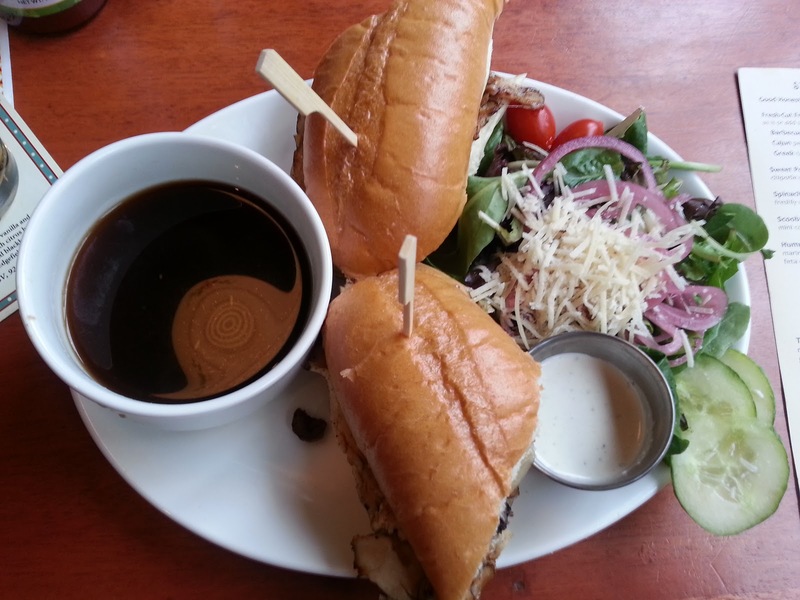 The French Dip. By default it it is standard with bleu cheese but you can "Make it a 'LEE'" (some bartender there) by adding Sour Cream, Bacon, and Jalepeno. I don't typically get extras on my dips but this was a special occasion and it is how LEE wants me to eat it, so why not. My "delicious" Busch Light tall can. It's not that good of beer but it is potable and cold. Here's the French Dip, LEE style served. It looks really good. Their bread is beautiful, very dark jus. A nice white plate, skewers with blue frillies and a nice dill pickle spear. Here's a close-up of the sandwich. The bread is really nice. Kind of pillowy looking, pretty white. And the cheese is nicely melted out there and there's a nice amount of roast beef. 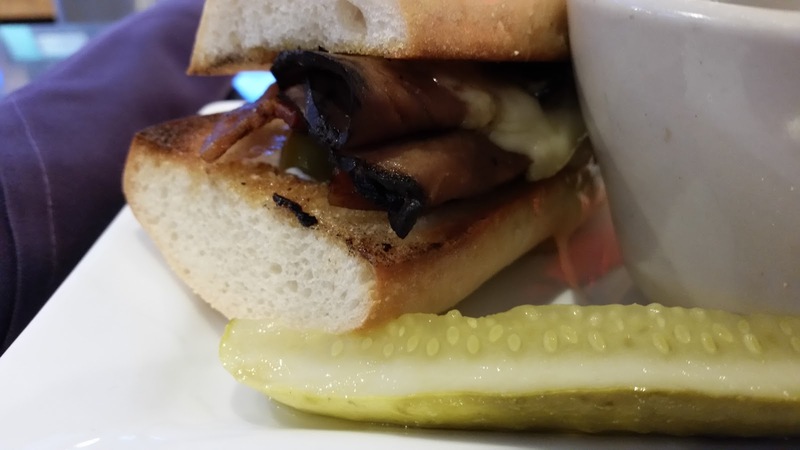 Another shot of the sandwich with the dill pickle spear. You can see the nicely grilled and slightly buttery bread. One of the first things I noticed was the dark jus. This is almost always a good sign of good jus (and it was good). It didn't have the oily sheen on top. I'm starting to wonder if I like it with or without the oil. Maybe without. Perhaps the butter from the bread and meat should provide that rather than oily jus. So maybe I have now decided. No oily jus jus me going forward. Here's the sandwich in hand. The roast beef looks very fine. It doesn't look greasy. You can see the cream cheese but it's not too much of it. I ate ONE HALF of this sandwich without the jus because it is so good. I really liked the flavor a lot. The bacon made it smokey. They cheese was good. The jalepenos added a really nice element and the cream cheese made it smooth. This is a great sandwich. But I debated the need for the jus. 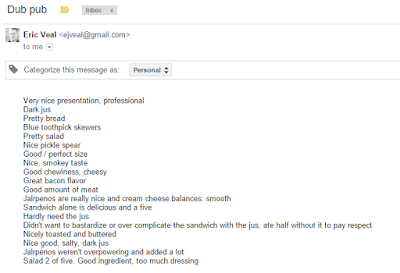 Why would I be bastardizing a very fine sandwich in jus? Isn't the jus to augment and add depth to a fairly plain meat sandwich? So after eating half of this sandwich without jus because it was just-that-good, I got to dipping. The jus is super dark and that's a great sign. The whole thing wreaked of quality. There's the money shot, friends. 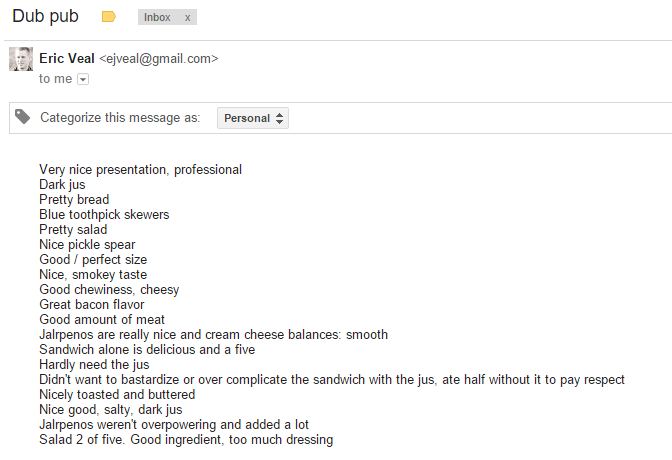 Here's the email I composed and sent to myself during this meal. It is getting ridiculous how rigorous I am with my reviews but it is still fun. I also do really enjoy writing them. It's fun to be detailed, thoughtful and opinionated and to share a joy. The sandwich has a very nice presentation. It is professional prepared and you can tell that care went into its making. Thank you very kindly, Mr. Chef person. Dark jus. The jus is very dark and that's a good sign. It didn't have an oily sheen and I'm starting to believe that's an asset as well. Pretty bread. The bread is very pretty. Is it homemade? Where did it come from. This is a very nice feature of the sandwich. Pretty salad. 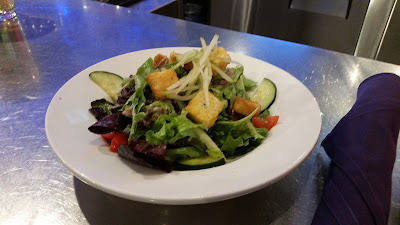 Yes, the salad was pretty but in the end it had too much dressing on it and I didn't enjoy it very much at all. I would strongly suggest always serving the dressing on the side so your guests can control their drizzle. Nice pickle spear. Yep, good pickles are good. Good / perfect size. Yes, the sandwich had a perfect size. Not too big or small. Good amounts of meat. Nice, smokey taste. The bacon added a lot. Good chewiness, cheesy. The bacon added some chewiness as well that was great. The flavor of this sandwich was outstanding. Good amount of meat. Nice roast beef that was good looking and plentiful and augmented very effectively by the other toppings. Jalepenos are really nice and cream cheese balances: smooth. I loved the jalepenos and cream cheese (and bacon and cheese) on there. It made for a great sandwich. Jalepenos weren't overpowering and added a lot to the experience. They were typical probably canned pickled types and that was good for me since I like jalepenos a lot. Sandwich alone is delicious and a five. Yep. No doubt about it. Great. Not a "fresh" sandwich like with veggies on it and whatnot but a very delicious one. Hardly need the jus. Yes, this is where I struggled. 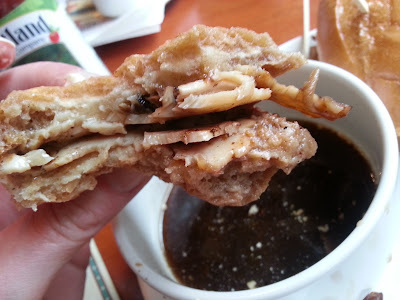 I love au jus but why would I need to put it on something that is already so salty and delicious? It detracts from the value the au jus could potentially add. I didn't want to bastardize or over complicate the sandwich with the jus, ate half without it to pay respect. Sandwich into Jus 3 of 5 I just don't believe that the jus is required in this case. I guess I would recommend this sandwich to anyone and the jus is nice to have as a backup. Maybe this thing is just so delicious it blew my mind. Or was it overwhelmingly salty between the various parts? Jessica's first French dip review is in the works. Feel free to ping me / us if you want to join our reviewing team. Just take pics, write up your notes and send it over. 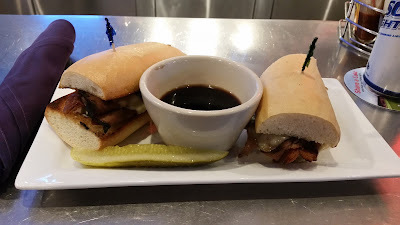 Jessica and I went out and had a great time for Halloween and I was in need of a French dip on the way home. We agreed it would be fun to go check out the new McMenamins establishment in Bothell, near where we live. 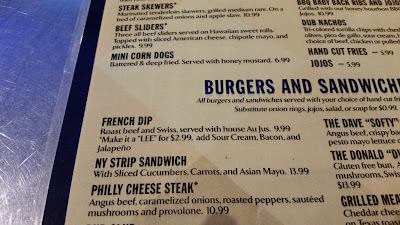 I was super excited to go there and was very pleased when I saw they had a French dip on their menu. So I was pumped. It looked like they'd put some effort into this thing and it was unique. So we ordered a red beer (Coors Light and tomato juice which can be so good, by the way) and waited and waited for our French dip to come out. Well, it did eventually arrive and I wish it never had. It ruined my day and made me angry for the rest of it. 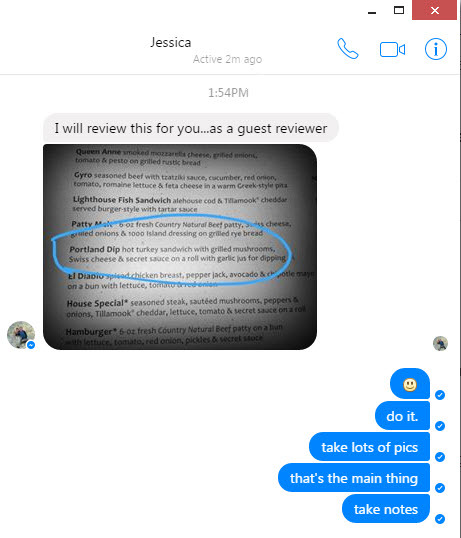 Sorry, McMenamins for this scathing review but I absolutely hate your French dip and really think you need to resolve that issue. It should be an anchor and it should be delicious. Take a look around this blog for ideas of things you could do right. This isn't right. 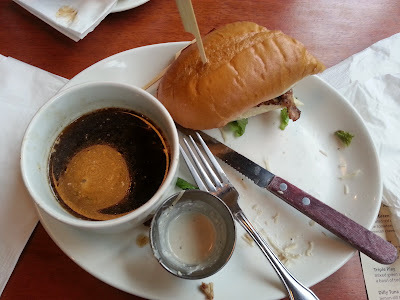 This is and was a terrible French dip. Do not get it. Take my word for it. I hated it with a passion and am still angry thinking about it. It was $17 and absolute garbage. 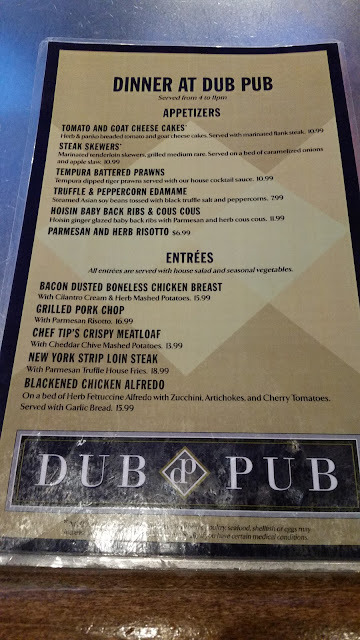 Yeah, they tried to make it fancy with their fancy cheese and onions and beer in the jus but it's garbage. And it was small and it tasted bad and took them a very long time to deliver and it was expensive! Watch all the photos as a video slideshow. Really cool new place in Bothell that I am super excited about. One of their three super cool restaurants on site. They also have a swimming pool, movie theater and hotel. I really like McMenamins. It took way too long for us to get served. I was not offered an alternative to fries, either. First impressions were disappointment. Small sandwich. No real girth to this thing at all. Sad. The jus had the 'floating fat' that I actually like and seek in a good jus but I would later come to find that I didn't really like this jus at all. There's the sandwich, I wasn't impressed. Gruyere was too bitter and the onions too sweet, coupled with the sweet jus. And what are Hogshead onions anyhow?! There's the sandwich. It was no good. Little bits of floating onion in this too sweet jus. This was an incredibly disappointing sandwich for the price. It was just no good. Made me sad. 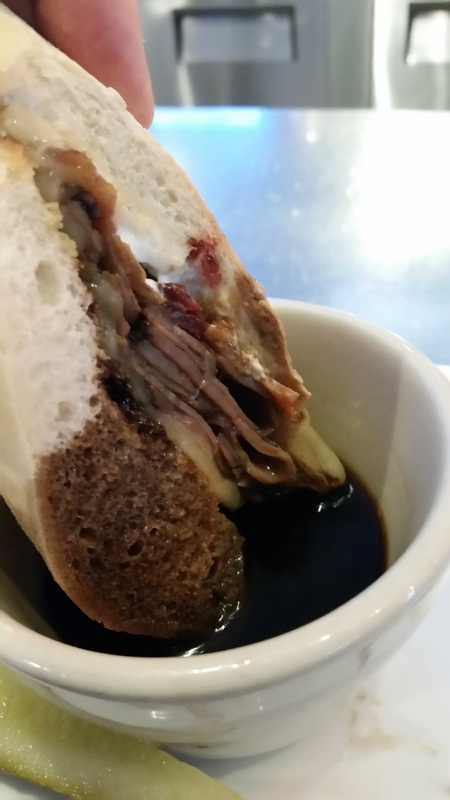 5 of 5 DeliciScore™ (From Heaven) Awarded to Metropolitan Market for their Prime Rib Dip Sandwich in Kirkland, WA on this 17th day of October, 2015 - Taking their French dip very seriously, as they should. I just started a new job and was talking to some coworkers during week one (about 4 weeks ago now) about my French dip reviewing hobby. One of the guys was telling me that the best French dip he had ever had was at Metropolitan Market (MM). I realized a little while later that there is a MM very close to my work in Kirkland, so I made it a point to walk there for lunch one day. Getting there. It was a comfortable fall day and I walked about 15 minutes to get there. Fall colors on the way there. A quaint little house in the middle of Kirland that looks very out of place (see next picture for confirmation). The Google Kirkland campus and the 12 flag flying. Go Hawks! More fall colors. More browns than I'd seen at this point during the season this year. I got to the deli, where their Prime Rib Dip was reported to be. I stepped up to the counter and there was a nice lady there ready to help me out. 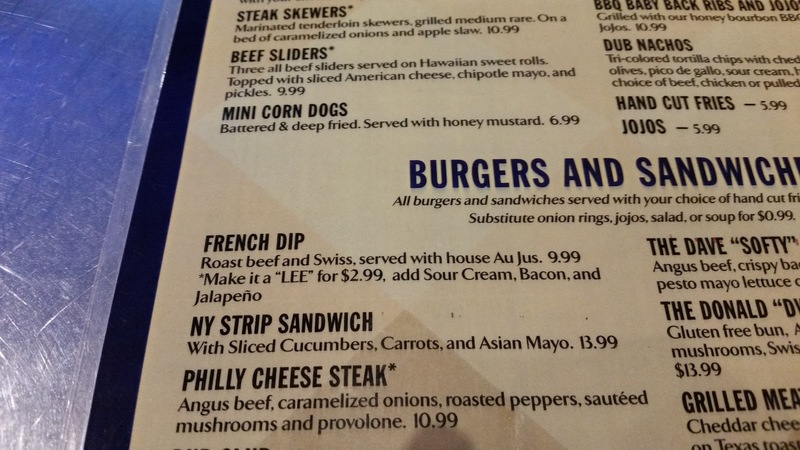 Another nice lady asked if I was the one who had called on the phone asking about the Prime Rib Dip. "Yes, that was me," I said with a proud smile. I'm still able to roll incognito. Not everyone yet knows about this hobby but they soon will. Comfort food reviews, people. Comfort food reviews. I was taking a picture of her slicing the very beautiful Prime Rib when she told me, "No pictures, please." So I had to put my phone away. 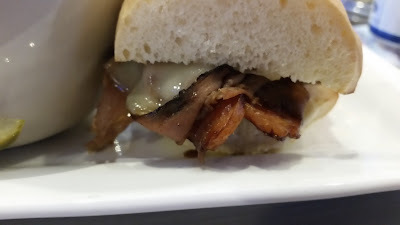 You'll have to imagine her drizzling fresh pan jus onto my sandwich, cutting the great-looking baguette, and carefully placing the perfectly pink prime rib onto the bread. 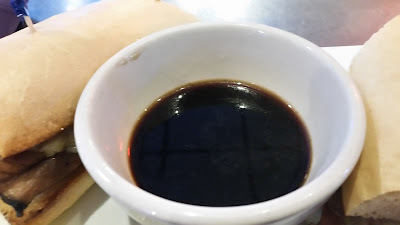 She wrapped it all up for me, au jus, and I paid and got to my seat, which was a shared lunch location with three other dudes who seemed to be video game makers. I didn't video tape the "unboxing" of this sandwich but I could have and that would have been satisfying for both me and you, dear reader. Here's a pic of the dark, naturally made jus with horseradish in the background. Here's a pic of the sandwich (upside down). Check out the BLOOD SPLATTERS on this thing. Also angular cut, which is requisite and strategic. BLOOD SPLATTERS! You can tell by looking at this thing that it means business. The bread is great. 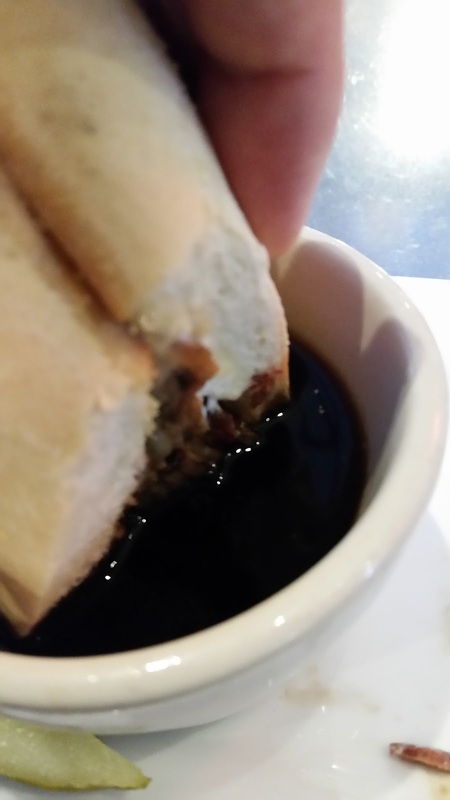 The sandwhich is pre-drizzles with pan jus (beef drippings). The size was not huge but they do offer one with additional meat for a bit more. The size was satisfying and sufficient. 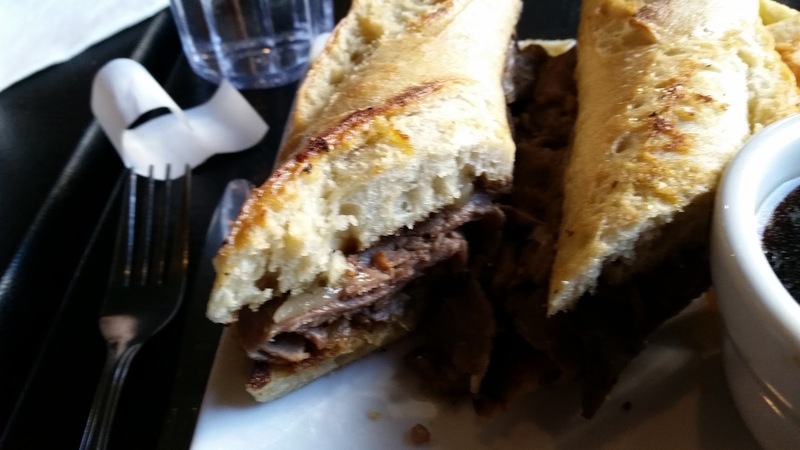 Here's a close-up of the meat and pre-moistened baguette. Blood splatters. Pink meat. Very authentic. A picture of the juicy, dipped sandwich. The size of the sandwich in hand on its way into the pool of jus. It will soon meet (meat?) its fate. Dark, nice jus. The money shot. It was really good! I also enjoyed using their side of horseradish. The meat had some fat in it but it was good. No complaint for that but I think I would prefer they remove all fat from the meat. I don't think too many people like to eat beef fat. The jus scored a 4 of 5 because it was not hot enough. However, it was the real thing and probably would score a 5 if there was a lot and it was hot. The price was $9.99. Not bad at all, in Kirkland, and with hand-cut Prime Rib. The sandwich comes by default with horseradish added pre-facto. I do not prefer this and like to control my own horseradish intake and for that reason asked for it on the side, which was a good call. The staff were nice and I could tell they were both passionate and proud of what they were doing. This is a great sandwich that can be found in a neighborhood grocery store (albeit a fancy one). The people put great care and pride into creating this very nice sandwich that scores a 5 of 5 for all of the right reasons. I'm a fan!